We love Daddy's Home 2 so much, we want to celebrate all of our favorite movie and TV dads and granddads. Plus Mark Wahlberg and Will Ferrell answer quick-fire questions from IMDb. Some good comedy moments drowned in schmaltz. Comedy and tragedy have always gone together hand-in-hand. Every great comedy tends to have its bitter-sweet moments: Roberts Blossom as the "shovel-killer" grandad in "Home Alone" (who always reminds me of my late Dad... in appearance I might add, not that he was a shovel killer! ); John Candy's depressed shower-ring salesman in "Planes Trains and Automobiles"; Ron Burgundy bawling in a phone box in "Anchorman". The balance between the two is the key thing and comedies can sometimes get it wrong (the Bird Woman in "Home Alone 2" for example!). 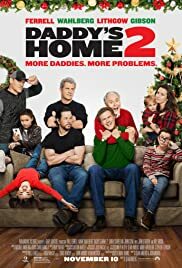 Here is another case in point: "Daddy's Home 2", which has some laugh-out-loud comedy moments, but is generally so utterly drenched in schmaltz and sentimentality that the film becomes far harder work than it should be. (By the way, I never saw "Daddy's Home" (but read the IMDB synopsys): it was not a prerequisite for seeing this movie). 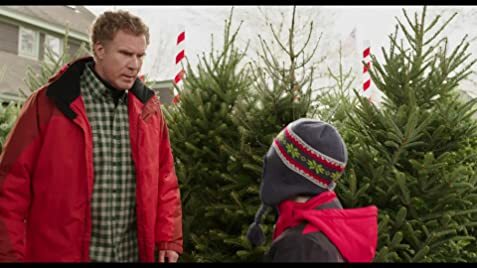 Will Ferrell ("Get Hard", "Anchorman") reprises his role as the somewhat incompetent Brad, 'sharing' his family of kids and stepkids with the much more streetwise Dusty (Mark Wahlberg, "Patriot's Day"). After a poignant school recital, the pair realise the damage that a distributed Christmas is doing to their offspring and they determine to spend Christmas all together this year. In the process they vow to try to put aside their attempts at one-upmanship - "the harbour is closed" - in the interests of giving everyone the best Christmas ever. But their plans are turned upside down when their fathers also turn up for Christmas: Mel Gibson (in a sublime piece of casting) plays Dusty's dad, astronaut-hero Kurt, who is even more macho and extreme than Dusty, and John Lithgow ("Miss Sloane"; "The Accountant") plays Brad's airy-fairy father Don... the apple has not fallen far from the tree there. Kurt forces the family to 'fight' Christmas on a neutral turf by renting a palatial AirBnB in a snowy wilderness. Tensions rise between the diverse individuals until a breaking point is inevitably reached. There are some great farcical sight-gags in this movie. Quite a few of the funniest ones are spoiled by the trailer, but there are still a few standout routines that made me guffaw. A hi-tech shower is predictable but funny; and Brad's use of a snowblower to apocalyptic ends is the funniest scene in the movie. 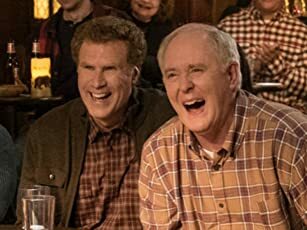 Wahlberg and Ferrell are a trustworthy double act (after their initial surprise pairing in "The Other Guys"). Gibson and Lithgow also inhabit their roles perfectly, although it was hard of me to relate to either of them. The scene on the airport escalator as they arrive is very well done. The supporting cast all play their parts well: ER's Linda Cardellini as Brad's wife and Dusty's ex-wife; Brazilian model and actress Alessandra Ambrosio, as Dusty's (almost unbelievably good-looking) new wife Karen; and WWE star John Cena as Karen's ex-husband. (Doesn't ANYONE stay married in the US any more?). The kid stars - Didi Costine, Scarlett Estevez and Owen Vaccaro - are also good, with Estevez being particularly appealing. Watch out for a funny cameo in the final scene as well, which I found very amusing ("You only have one story" ... LoL). What drowns out the comedy though is the sentimental storyline around a personal tragedy being lived out by one of the family. The angst and nasty back-biting that surrounds this I found neither funny nor pleasant. The story builds to a snow-bound cinema (showing "Missile Tow" starring Liam Neeson... a great "pointless answer" for the BBC's "Pointless" quiz!) and a finale song that is just so over the top that it has both an "awww" factor and is bile-inducing all at the same time. The screenplay is by Sean Anders and John Morris, with Anders also directing. Will Ferrell films can be like a game of Russian Roulette, and I fully expected this to be truly awful. It wasn't, and as a Christmas comedy it is an OK watch... and thankfully significantly above "Jingle all the Way"! (For the graphical review, please visit bob-the-movie-man.com or One Mann's Movies on Facebook. 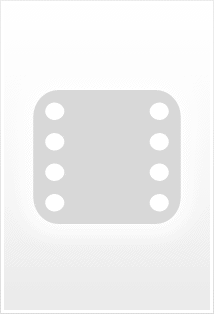 Thanks).